Like US violence in Asia, the symbolic infantilization of Asians has a long history. 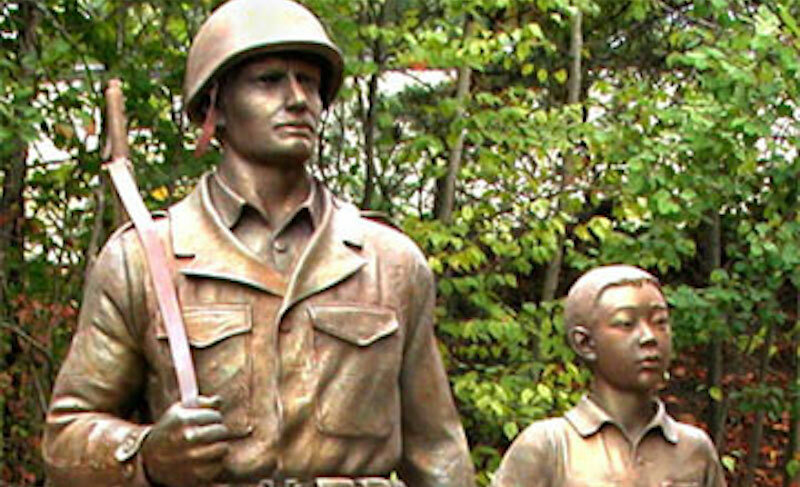 The Korean War Memorial in Worcester, Massachusetts depicts an American GI and a Korean child side-by-side. The Trump administration’s aggressive stance toward North Korea has been one particularly troubling matter, among many, since the president took office last year. Since Vice President Mike Pence’s visit to the Demilitarized Zone in April, it has seemed we’re teetering on the possibility of catastrophic conflict on the Korean Peninsula. One aspect of the situation that has received too little attention is the unmistakable anti-Asian racism that runs through the discussion in the United States. It is not only Donald Trump who portrays North Korean premier Kim Jong-Un as a child with the pejorative nickname “Little Rocket Man,” but something that is pervasive in the mainstream media conversation. One need not have any sympathy for the authoritarianism of the North Korean regime to be shocked by the racist caricatures of Kim that have become common in major media outlets. Indeed, the straightforwardly offensive, cartoonish portrayal of Kim — whose father, the previous North Korean premier Kim Jong-Il, received similar treatment — appears in print largely unchallenged, and with mundane regularity. This is not the first time that the United States has cast itself as a reluctant destroyer in the region. On the day that the US brought utter destruction to Nagasaki in August 1945, having already bombed Hiroshima, President Harry Truman gave a radio address insisting that such devastation was not the government’s first choice. “The world will note that the first atomic bomb was dropped on Hiroshima, a military base,” Truman declared — falsely. “That was because we wished in this first attack to avoid, insofar as possible, the killing of civilians.” He concluded the thought, however, by saying that the US would be forced to kill countless civilians if Japan did not surrender. Thus emerged the United States in its new role: possessor of a scientific superiority that earned it the destructive power of atomic weapons, as well as the supposed rationality for the wise — if undesirable — use of such power. This was held in contrast to Japan’s behavior, which was portrayed as irrational and fanatical. Like US violence in Asia, the symbolic infantilization of Asians has a long history. It has not been the only form that the representation of an Asian enemy takes. 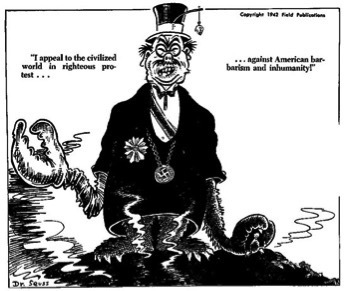 During World War Two, Japanese Emperor Hirohito was caricatured as a literal monster as in this 1942 Dr. Seuss cartoon. Far from the tantrum-throwing child that Kim is cast as today, Hirohito and Prime Minister Hideki Tojo were presented as violent masterminds that had to be stopped at all costs. These portrayals of Asians were more akin to the “Yellow Peril” stereotype, which was also deployed alongside the restriction of Asian migration to the US in the nineteenth and twentieth centuries. The racist caricatures invented by the US government and media have varied in form, but they share a purpose: concocting an Asian “enemy” to be feared, restricted, or destroyed. Prior to World War Two, during the United States’ colonial war in the Philippines at the turn of the 20th century, the Filipino adult population as a whole was considered a threat — a familiar motif throughout the history and reach of US empire. 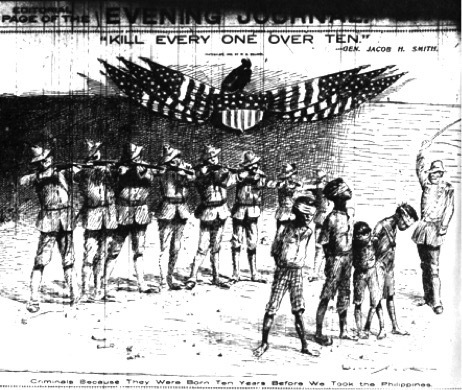 This found brutal expression in the US conquest of the island of Samar in 1901. In that episode of the occupation, General Jacob H. Smith gave the infamous order to American troops to kill everyone over the age of 10, resulting in the massacre of thousands. Thus an entire adult population was cast as a threat to be eliminated through violence. This is one particularly crude and brutal form of infantilization, coming not through the representation of Filipinos as children, but rather the actual, genocidal reduction of a Filipino population so that only children remain. Because the war in the Philippines was nakedly colonial (with the Philippines remaining a US territory until 1946), the act of producing a nation of children without parents went hand-in-hand with the notion that such a nation would have to be literally and figuratively parented by the United States. The infantilization of Asians has a particular place in US empire’s disturbing history on the Korean peninsula. Known as the “Forgotten War” in the United States, the 1950-1953 Korean War killed millions of Koreans and resulted in social catastrophe. One aspect of the war and its aftermath was the destruction of families and the creation of large numbers of orphaned Korean children. Americans became involved with orphanages in South Korea both through the unofficial activity of US military personnel as well as American Christian adoption agencies. As scholar of Asian American Studies and US empire Jodi Kim has noted, “The adoption of Korean babies after the end of the Korean War inaugurated what ultimately developed into the world’s largest and longest standing transnational adoption program”. 3 Moreover, as in Japan, an enormous US military presence — involving tens of thousands of troops and military bases throughout the country — was a feature of post-war South Korean society and endures to this day. Though it is currently being negotiated, the United States military retains “operational control” of South Korean forces in wartime, more than six decades after the supposed end of the Korean War. 4 The South Korean state therefore remains subordinate to the United States in the geopolitical sense, and the United States' postwar relationship with South Korean society was one in which the latter was cast as a place of children in need of parents. In recent years before Trump took office, as Kim Jong-Un and his predecessor have pursued nuclear weapons, they have often been portrayed as unruly children. In his aforementioned 1945 radio address, President Truman said that it was the duty of the United States and its allies to maintain a monopoly on the creation and use of nuclear weapons because they are “too dangerous to be loose in a lawless world.” “We must constitute ourselves trustees of this new force — to prevent its misuse,” Truman said, enshrining a nuclear-armed American paternalism. Those of us concerned with rising tensions on the Korean Peninsula should support disarmament of all parties, starting with the United States. The US remains the only country to have used atomic bombs in war, and its nuclear testing regime has lasting consequences in the Pacific. The United States’ imperial, racist paternalism has no place in the demilitarized future that we are fighting for. 1. Dower, John. "Occupied Japan and the American lake, 1945-1950." America's Asia: Dissenting Essays on Asian-American Relations. Vintage Books, 1971. 2. McCormack, Gavan. Client state: Japan in the American embrace. Verso Books, 2007. 3. Kim, Jodi. "An" Orphan" with Two Mothers: Transnational and Transracial Adoption, the Cold War, and Contemporary Asian American Cultural Politics." American Quarterly 61, no. 4 (2009): 855-880. 4. With no formal peace treaty ever signed, the Korean War has yet to officially end. Khury Petersen-Smith is a scholar and activist who focuses on US empire, race, and resistance. He lives in Boston.